It has been a long time since I have had an alcoholic beverage. In fact, except for a sip of my parents' homemade wine or a sip of champagne at my brother's wedding, I have not had a drink this year! Now that I am not pregnant, it seems crazy that I can finally indulge in an alcoholic beverage. 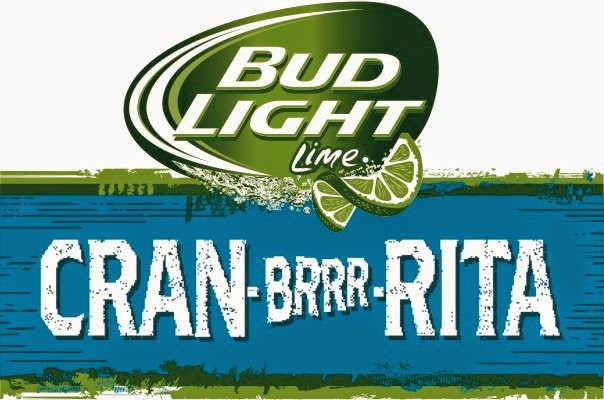 I recently heard about a tasty new beverage which is the Bud Light Lime Cran-Brrr-Rita. It literally just came out to stores on November 3rd. This would be a fun drink for the holidays. I love cranberry things and I could see this being served for both Thanksgiving and Christmas. To make it even more festive, you could pour it in a nice glass and float fresh cranberries in it. You could also even make a punch with it including sherbet and possibly a lemon-lime soda or club soda. My parents make a drink like this for different parties a lot and it goes over very well. These come in a 6 pack and can be found at your local grocery stores. I had the opportunity to try another flavor and thought that it was tasty. It was sweeter than most drinks that I would usually have so I added a bit of club soda and preferred it that way. These drinks help you feel like you are really in the holiday season. Something to note, they are to be served over a lot of ice. This is a fun drink for those who do not like beer all the way since it is a lot sweeter than a typical beer. These would be good for if you are hosting a party or you could bring them to a party as a hostess gift. Also, these come in different flavors as well. My sister purchased the apple flavor recently and enjoyed them in the early fall. Try pairing them with a cheese platter with goat cheese, different kinds of crackers, grapes, pecans and other fancy cheeses. It would be simple but elegant.